I first picked up a camera in 1975 for the sole purpose of photographing trains. It was a bonding thing between my older brother and I, and still occasionally is. 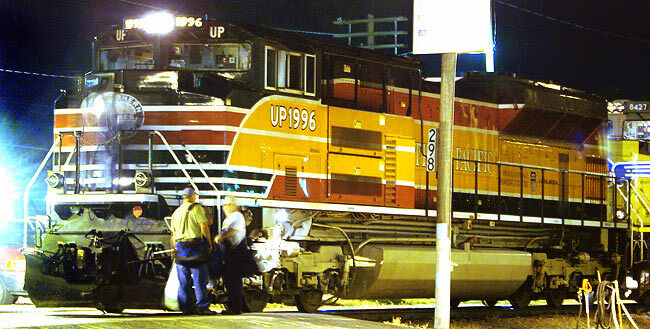 He emailed in the wee hours Thursday morning that a Union Pacific (UP) Heritage locomotive would be through Hutchinson that day, and provided a link to a schedule. UP's Heritage locos are modern (boring, if you ask me) engines saved from mediocrity by wearing stylized adaptations of the paint schemes of various railroads that Union Pacific absorbed over the years in its amoeba-like march across our nation's rail network. I'd seen one of them a couple years back - their MKT railroad homage (above). The locomotive due through Hutchinson on Thursday was painted as a Southern Pacific - appropriate since that railroad once permeated the area. Like I said, there was a schedule so this was a piece of cake, right? Just find a suitable location along the UP rails and wait for the thing to show up during the anticipated time frame of 4:20-5:20 PM. Simple. At first I preferred to catch it at Eastside Cemetery, an engine painted in the likeness of a dead railroad being sort of like a rolling tombstone. 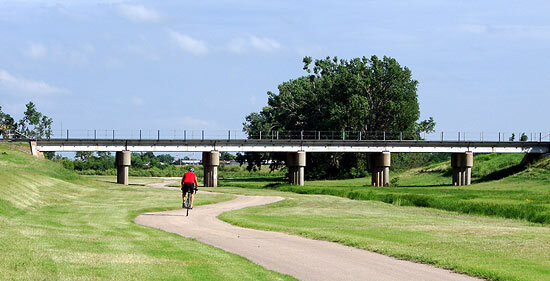 The sun would be wrong for that soon, though, so I parked on the dead-ended Avenue "B" and headed to the UP trestle over Hutchinson's flood control ditch at the east edge of the city. The Jim P. Martinez Sunflower Trail gave good access and lent some nice serpentine curves. 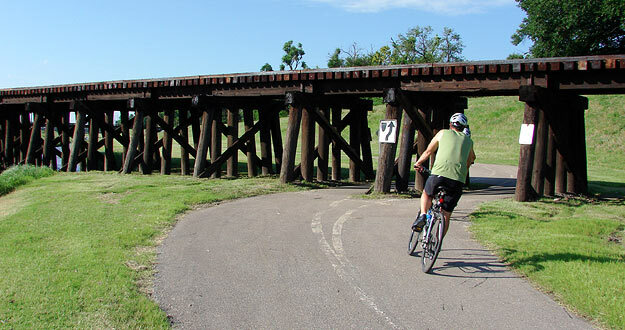 While I waited, I appreciated the low wooden construction of the Kansas and Oklahoma Railroad's trestle. I believe it was originally built by the Missouri Pacific. Here's another view. This would be good during the morning. 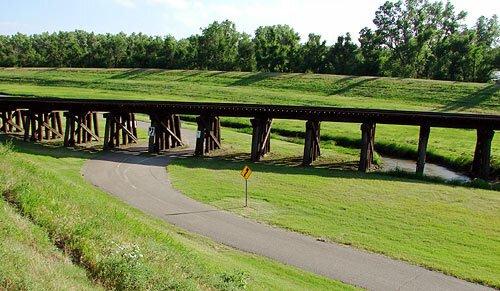 There's also a BNSF trestle to the north of this. At 5:11, near the end of the target time frame, I heard locomotives approach. It wasn't the train I was after, but I did like seeing this pair of older locomotives. 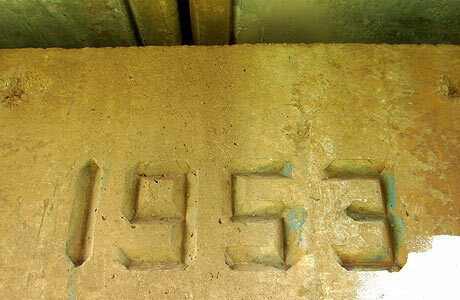 While I was walking back and forth to the trestle to get some exercise, I found the construction date, at least of the concrete parts - 1953. According to old maps I've found, this would have been built by the Rock Island Railroad. As I waited well past the original time window, I wondered what all the bicyclist and roller-bladers thought I was doing there, just walking back and forth with s camera. Had I a phone like my early-adopter friend, Patsy, who lives in Newfangledland, instead of the tough but "just a phone" thing I carry (being a resident of Stodgyville), I could have checked the net for schedule updates. I didn't know it yet, but the train had been delayed in Texas that morning. 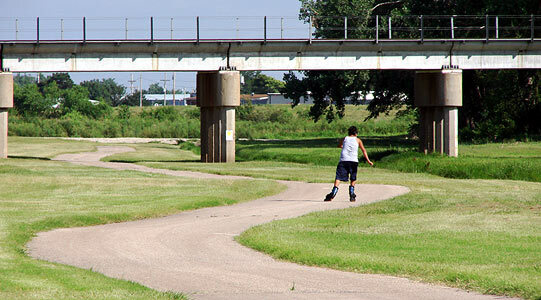 At 6:24, as this UP train came along (not the one I wanted), it hit me that by putting a walking trail under three active railroad trestles, Hutchinson has inadvertently created a railroad park. 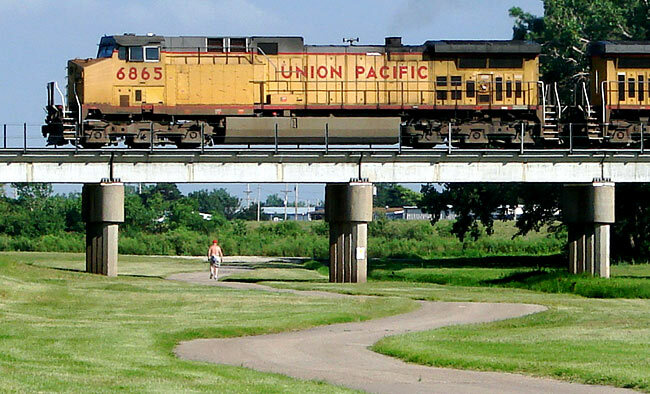 Let's call it the Hutchinson Railfan Park, and hope the name catches on. The city of Hutchinson should recognize this and promote it a bit. The addition of a small shelter and maybe a few parking spaces wouldn't hurt. Hutch needs more Internet presence. The official city pages pertaining to architecture and history, many of which are very good, have a problem being invisible. I sometimes think our city motto should be "Come Share our Stealth" instead of "Come Share our Space." Eventually I went home and checked the locomotives schedule and found out it was many hours behind - so much so that it would be dark when it passed through Hutch. The only decent chance was to go to Pratt, one hour away and catch it during the dwindling daylight. I had a friend near Pratt who needed photos shot, so that wasn't such a bad idea. Besides, I had my brother on the phone during some of this and wanted to capture the spirit of our teenage railfan adventures. But these are not the days of old, as evidenced by this sign at the border of UP property in Pratt. The railroad employees were very helpful with schedule information; the train would not be in until after 10:40 PM - well after dark. They recommended I wait just off railroad property, which I did. At some point, someone called 911 but the officer that showed up to check me out noted that I was on a public street and thus, OK. He was quite polite. At 11PM, over nine hours after it was scheduled to arrive in Pratt, the train showed up and stopped for a couple minutes. The angle isn't the best, but it's all I had to work with. The exposure is three seconds on tripod, f:4, ISO 100, very telephoto, incandescent white balance and then Photoshopped for contrast and further color correction. It's regrettable that the Southern Pacific lettering is mostly hidden. The nose logo is blurred due to the door it is on being swung open during the exposure. A side view would have been blocked by cars and trucks in an adjacent lot. 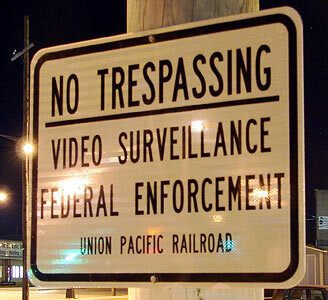 The number is 1996 because that's the year that UP acquired the Southern Pacific. And why use a time exposure rather than flash? Because modern locomotives are decorated with material so reflective as to dominate a flash photo. I tried it anyway as the train pulled away. Hours after I returned to Hutchinson, I saw the train pass near my house at 2:51 AM, 10 1/2 hours after I first anticipated it as a two-hour outlay of time. Yeah, now I remember why I don't do this anymore, except for more classic locomotives. Enjoy your train posts and thanks for the link to the previous post (classic locomotives)!